Elizabeth Jane Cochran came into the world on May 5, 1864. Mrs. Cochran delighted in the baby, her first daughter, dressing Elizabeth in a pink gown for her christening. The fun was not to last. When Elizabeth was only six, her father died without warning and without a will, plunging Elizabeth and her family into dire financial straits. Several years later, Mrs. Cochran remarried, to a man who was often drunken and abusive. As soon as she was old enough to work, Elizabeth left home to train as a teacher, but ran out of tuition money after only one semester. With no money and no other ideas, she and her mother moved to Pittsburgh, where Elizabeth helped run a boarding house. It was in Pittsburgh that Elizabeth found her calling. The city's Dispatch ran a weekly column by a self-important man named Erasmus Wilson, who called himself the “Quiet Observer.” One week in 1885, Wilson published an op-ed entitled “What Girls Are Good For.” The answer, according to him, was housework. It was unseemly and ugly for ladies to work, he wrote, describing working women as a "monstrosity." Elizabeth was having none of this. She penned an angry letter to the editor, signing it, provocatively, “Lonely Orphan Girl.” The letter was no work of art—Elizabeth had left school at 15, after all—but editor George Madden was impressed by its writer’s fervor. He placed an advertisement in the next issue of the Dispatch, inviting the Lonely Orphan Girl to come forward. She did, and he offered her a job. To protect her identity and her reputation, Madden soon recommended she select a pen name. The two settled upon Nellie Bly, after a popular song by Stephen Foster. Bly came out with guns blazing. From the very beginning, she was determined to write stories that mattered. She had no experience, no education, and little polish, but she had a fire in her belly that few newspapers had ever seen. She wrote about women’s labor laws. She wrote about sexist divorce laws. She convinced Madden to send her to Mexico, but before long she was expelled for exposing government corruption. The year was 1887, and Nellie Bly had just talked her way into a job at the New York World. For her very first story, Bly agreed to feign insanity in order to gain entry to the Blackwell’s Island Insane Asylum. After checking herself into a women’s boarding house under yet another fake name, Bly began acting erratically, peppering her speech with Spanish nouns and claiming she had lost her memory. That night she asked for a pistol. This was apparently all it took; the proprietress called the police, who hauled Bly off to court. Bly spent 10 days in the Blackwell’s Island Insane Asylum, during which time she saw and was the victim of horrific treatment. The asylum’s residents were mostly poor and immigrant women, some of whom were locked up simply because they could not speak English. The women were beaten, starved, and forced into ice-cold baths—a fate from which even Bly’s nice clothes could not save her. The paper published "Ten Days in a Madhouse" in serial form. By the time the last installment hit newsstands, New York was paying attention. Bly’s fearless reporting paid off. A grand jury investigation of the asylum confirmed many of her observations, and the institution was eventually shut down. Still, Bly was just getting started. Bly became a sort of journalistic Robin Hood, exposing the darkest corners of New York City society. 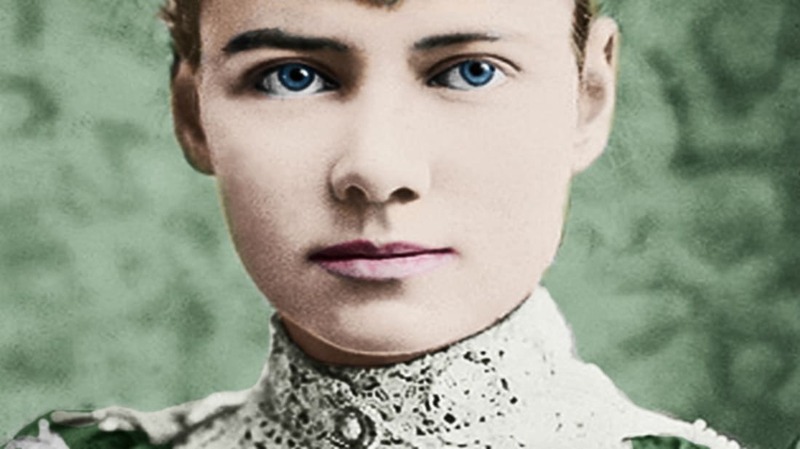 Wherever women, children, or the poor were being mistreated, you’d find Nellie Bly. She went undercover as a poor clinic patient and narrowly escaped [PDF] having her tonsils removed. For her story “The Girls Who Make Boxes,” she joined the ranks of young women working in a factory. She visited seven different doctors and got seven different diagnoses and an “extraordinary variety” of prescriptions. She visited a home for “unfortunate women.” She lived for two days in one of New York’s poorest tenements in the hottest part of the summer. She bought a baby on the black market. No, really: she bought a baby. I bought a baby last week, to learn how baby slaves are bought and sold in the city of New York. Think of it! An immortal soul bartered for $10! Fathers-mothers-ministers-missionaries, I bought an immortal soul last week for $10! Bly decided to conquer the world. Jules Verne’s novel Around the World in Eighty Days, first published in 1873, was all the rage in 1889. Eighty days was pretty impressive given the transportation options at that time, but Bly thought she could do better. After convincing her editors to finance the whole thing, Bly bought a sensible dress and set off. The rest, of course, is legend. Bly made it home in 72 days, 6 hours, and 11 minutes. She even had time to stop in France for tea with Jules Verne. The story made her a household name. Inspired by Bly’s work, other women began to follow in her daring footsteps. Because these undercover stories were the province of “girls,” their brave work was dismissed as “stunt reporting.” Today we’d call it investigative journalism. Bly met industrialist Robert Seaman in 1895 and married him a few days later, leaving the newspaper life behind. Seaman was 40 years older than his bride, but neither seemed particularly fussed by the age difference. Their marriage lasted nearly ten years, until Seaman’s death in 1904. Elizabeth Cochrane (she later changed her name to add the e) Seaman inherited all of her late husband’s holdings, including his Iron Clad Manufacturing Company. Another widow might have handed the company over. Bly decided to run it herself. Bly had no experience in this arena, but that had never stopped her before. By 1902, she was filing patents for new types of oil barrels. As an employer, Bly embodied all the principles she had championed in her stories. She paid her workers fairly and offered them access to gymnasiums, libraries, and healthcare. This was unheard of. Unfortunately, there was a reason for that. Treating employees like human beings was expensive, and before too long her businesses went under. Bly returned to the newsroom during World War I. She was still working in 1922, when she died of pneumonia at the age of 58. Nellie Bly was an unwavering advocate for social change, a journalistic dynamo, and a force of nature. She wasn’t the first woman of her time to join a newsroom, but she was certainly the most ferocious.